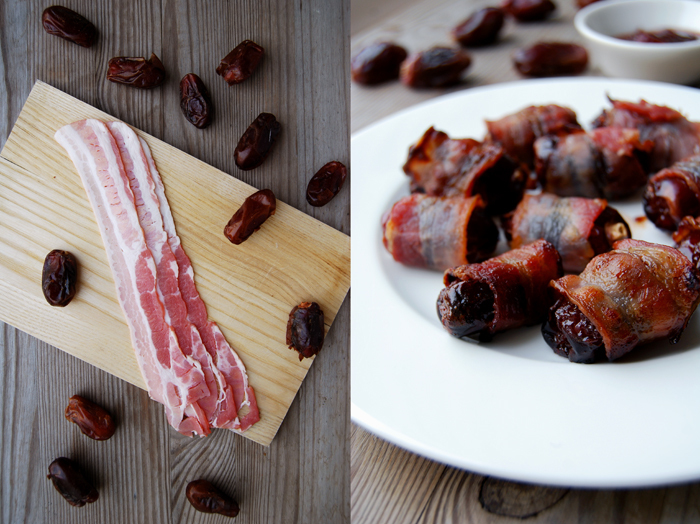 Devils on Horseback, dried fruit wrapped and baked in bacon, are a typical winter dish, but the temperature dropped, it’s a bit grey outside and I wanted to try something new with my chutney. 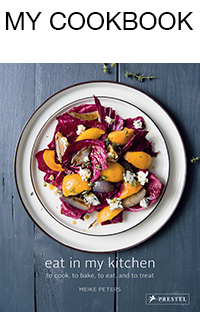 It’s still a great finger food nibble, even in spring! After I made my rhubarb chutney I thought about new combinations besides the classics with cheese, meat or sandwiches. A package of dried dates caught my attention, I had bought them a couple weeks ago from a Turkish shop I discovered while strolling through the streets. I went inside to check out their meat section as you can get the best lamb from Turkish butchers but I was a bit late and the shop was closing. On my way to the cash point I grabbed a package of dates unsure of what I would use them for and hopped back out onto the busy streets. 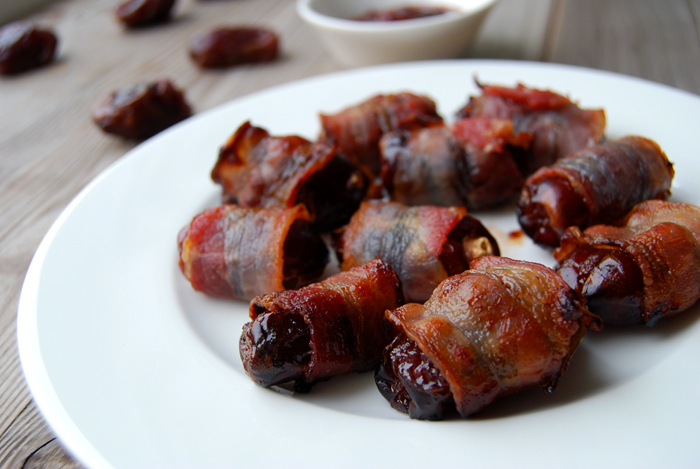 The dates finally found their purpose, I filled them with chutney, wrapped them in slices of bacon and baked them in the oven. 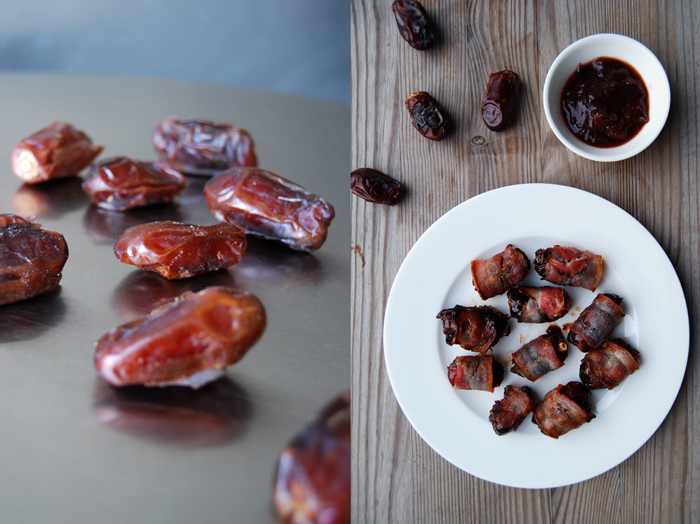 Sweet and sticky, salty and a bit sour, my chutney filled dates wrapped in crisp bacon! It sounds like an attack on the taste buds but it’s actually a very harmonic combination, all the flavours melt together smoothly. My rhubarb chutney hasn’t sat yet, I want to give it a couple more weeks, so I used my plum chutney (the same recipe, just with plums). It’s very easy to prepare these nibbles, you just need a few dried dates (as a snack for 3 I used 15 dates) and replace their seeds with some chutney (the plum chutney was very good but I tried one with rhubarb and it was good too). 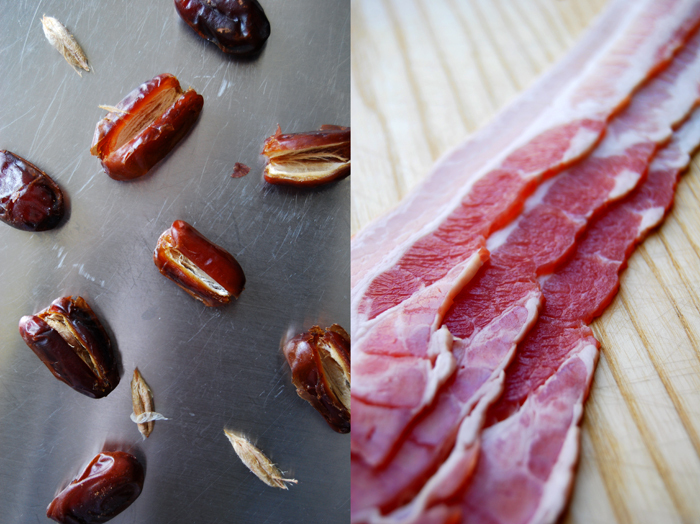 I cut a strip of thinly sliced bacon into 3 and wrapped each piece around a filled dated. Baked in the oven on 200°C / 390°F they turned golden and crisp after a few minutes!